On 23 April 1999, a NATO missile attack on Radio Television of Serbia (RTS) headquarters killed 16 employees of the state broadcaster. The forgotten war crime occurred during the Kosovo War (March 1998-June 1999), and was part of NATO’s aerial campaign alongside the US-backed Kosovo Liberation army, in opposition to the Federal Republic of Yugoslavia. Blair was not alone in praising this violation of international law. His Secretary of State for International development, Clare Short, said afterwards that, “the propaganda machine is prolonging the war and it’s a legitimate target”. Short is a Labour Party member and her official title today is The Right Honourable Clare Short. Defending these killings was neither right nor honourable one can assume. NATO themselves commended the deliberate attack afterwards. NATO’s military spokesperson Air Commodore David Wilby declared RTS, “a legitimate target which filled the airways with hate and with lies over the years”. This followed on from a number of other NATO attacks on radio and television outlets in the country. Pentagon spokesperson Kenneth Bacon also legitimised the war crime saying that, “Serb TV is as much a part of Milosevic’s murder machine as his military is”. Not to be outdone, the respected US diplomat and magazine editor Richard Holbrooke described the bombing of RTS as, “an enormously important and, I think, positive development”. The British Prime Minister on this occasion, David Cameron, did not justify the killing of journalists and said, “We stand absolutely united with the French people against terrorism and against this threat to our values – free speech, the rule of law, democracy”. Cameron went on, “we should never give up the values we believe in… a free press, in freedom of expression, in the right of people to write and say what they believe”. In the aftermath of the Charlie Hebdo attacks, millions marched to honour the dead with the slogan “I am Charlie” becoming famous. When the Serbian journalists and employees were killed just over 15 years before, there was no international motto of “I am RTS”. The UAE has paid tens of millions of dollars to expand its regional and international influence by buying positions and the loyalty of key figures, an Al Jazeera documentary has said. Aired yesterday, “Men around Abu Dhabi” claimed the Emirates paid former British Prime Minister Tony Blair, the international envoy to Libya Bernardino Leon and a number of leaders of the US Department of Defence in order to keep them on side. 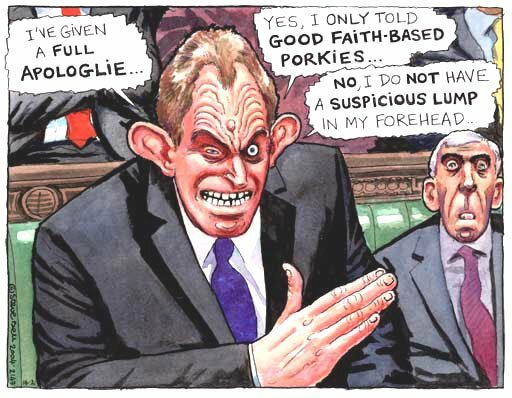 The channel said that UAE paid $35 million to Tony Blair when he was the envoy for the Middle East Quartet. He was also paid as a consultant, leaked email published by the Sunday Telegraph revealed. The UAE government paid about $53,000 per month to the Spanish diplomat Bernardino Leon. Last year, the UAE Diplomatic Academy, which is headed by the UAE’s Minister of Foreign Affairs and Chairman of its Board of Trustees, Sheikh Abdullah Bin Zayed Al Nahyan, announced that Leon, who served as UN envoy to Libya, will be assigned as its general manager. At that time, media sources considered the news as a scandal that would undermine the credibility of the United Nations. Abu Dhabi also paid $20 million in donations to the Middle East Institute in Washington, which is run by US General Anthony Zinni. Zinni is an American general who once led US forces in the Middle East. After retiring, he served as a special envoy to the region. The US administration chose him and Assistant Secretary of State for Near Eastern Affairs, Timothy Lenderking, as envoys to support the Kuwaiti mediation to resolve the Gulf crisis. There is also James Mattis, the current US secretary of defence, who was previously hired by the UAE as a military adviser to develop its army and Robert Gates, the former US secretary of defence who attacked Qatar’s policies and Al Jazeera. The documentary also revealed that Turki Aldakhil, the director of Al Arabiya TV channel, received more than $23 million in return for promoting Abu Dhabi’s agenda in the region. On 5 June, Saudi Arabia, the UAE, Bahrain and Egypt severed diplomatic relations with Qatar and imposed punitive measures on the small Gulf state accusing it of “supporting terrorism”. Doha strongly denied the claims. Dozens of Nazi forces have raided the headquarters of a Palestinian radio station in the occupied West Bank overnight and shut down the media outlet for six months. Al-Hurria station in the city of al-Khalil (Hebron) was shut down “for content inciting violence and encouraging terrorism,” Nazi army spokeswoman said on Thursday, without providing further details. Nazi forces also confiscated technical equipment during the raid, a source at the station said. The station has been informed it would be closed until April. “We thought it was related to the campaign of arrests but were surprised to see they were targeting the radio’s premises,” al-Hurria’s Director Ayman al-Qawasmi said. “Unfortunately, they destroyed everything inside the building, there is nothing left. They confiscated broadcasting equipment, microphones,” he added. An AFP photographer at the scene described the damage as “considerable,” with equipment and signs torn from walls and furniture upturned. Al-Hurria, which means freedom in Arabic, was previously closed for six months in November 2015 immediately after the outbreak of a fresh wave of conflicts in the occupied territories. Nazi army continues crackdown on Palestinian media outlets over allegations that they prompt young Palestinians to engage in armed clashes against Nazi forces in the West Bank. In August 2016, Nazi officials stormed the office of Palestinian Arabic-language Radio Sanabel in the town of Dura, southwest of al-Khalil (Hebron) and took it off the air over what they described as its attempts to further escalate tensions in the occupied West Bank. Nazi forces also ransacked the building, and confiscated the radio’s broadcasting equipment. The occupied Palestinian territories have witnessed new tension ever since Nazi forces introduced restrictions on the entry of Palestinian worshipers into the al-Aqsa Mosque compound in East Jerusalem al-Quds in August 2015. 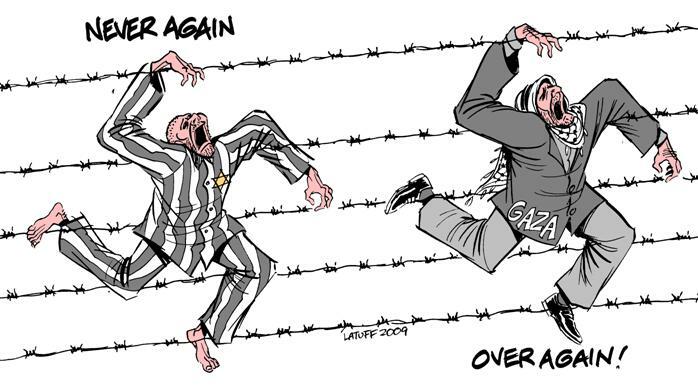 More than 300 Palestinians have lost their lives at the hands of Nazi forces since the beginning of October 2015. Strong words. But Moscow doesn’t seem particularly impressed. Russian Foreign Minister Sergey Lavrov stressed that his government has “no information” about anyone planning an attack on Israel—and reminded all relevant parties that bombing sovereign nations for no reason whatsoever is a violation of international law. Moscow has no information about anyone preparing an attack on Israel, Russian Foreign Minister Sergey Lavrov said following his talks with the emir of Qatar on Wednesday. “We don’t have any information about anyone preparing an attack on Israel,” the Russian top diplomat said commenting on media reports stating that Iran plans to deploy high-precision missiles, capable of hitting Israel, to Syria and Lebanon. “If anyone in the Middle East or in other parts of the world plans to violate international law by infringing on the sovereignty and territorial integrity of other states, including the countries of the Middle East and North Africa, it is reprehensible,” Lavrov added. […] We are truly facing a great victory (against Daesh in Lebanon). From there, consider that on May 25, 2000, we expelled the Zionist Occupying (Lebanon) and today we all (the Syrian and Lebanese armies and Islamic Resistance) have expelled the occupying terrorist takfiri. This is one of the fundamental similarities. On the border, vast and sensitive areas (mountains, hills, strategic positions) were in the hands of the Zionists, and here also, vast expanses, mountains, heights, hills, strategic positions were in the hands of the takfiris. At the border, accross the international border, the Israelis were a permanent threat and that is always the case, and takfiris were a threat at every moment against all of Lebanon, especially against all the Bekaa, not only against Baalbeck-Hermel and border villages. Lately, everyone knows that they planned there, in the Jurd of Ersal, Daesh was preparing suicide operations and attacks in Zahle and in the surrounding villages, but the intelligence services of the Lebanese army discovered them before the operations were conducted. Today we face this reality. And maybe it would come to the mind of some to say “ô Sayed [Nasrallah], as regards Israel, it is something very different (from what happens today).” But no, it is a continuation. Day after day, it is shown that these Daesh and takfiri groups have been created by American power and fought to realize the Israeli project. They fought (in the interest of the) Israeli project. And what these takfiri terrorist groups have offered Israel, Israel could never get for decades. And more dangerously… I do not want to classify these two dangers, because I believe that these terrorist groups are fighting within the American-Israeli project, whether they know it or not. Their leaders know for sure. The fools are the fighters who got fooled by false and superficial slogans. Israel is an occupation and hegemony project. Israel is an occupying project. The United States are a project of hegemony. Daesh and other takfiri groups are an extermination project. The extermination of all that is different (from them): Muslim, Christian, Sabean, Yazdi, everything. That is an extermination project. The extermination of man, of History, of civilization, of society, of all things. And then when our region is destroyed, its armies, its plans, its states, its institutions, its social structure, it will be offered (on a silver platter), primed, cooked to perfection, roasted and stuffed to America and Israel, so that they seize it and impose their conditions on everyone. And that’s why today, who is shedding tears over the fate of Daesh in Syria, in Qalamoun and in Iraq? Netanyahu and Israeli officials! It is they who mourn (bitterly) and yell sorrowful lamentations! Currently, their problem with the Trump administration is that it committed itself to the eradication of Daesh as a priority, the same administration that recognizes that this is the Obama (and Clinton) administration who created Daesh. This is why no one should come and say that there is a big difference between the Liberation of South(-Lebanon in 2000 against Israel) and this battle (against Daesh) and that the liberation of South ranks first (in importance), and that (the Liberation of our borders) is in 10th place (for example) in any way! (Liberation of southern Lebanon against Israel) is first, (the Liberation of our borders against Daech) comes right away in second place! For it is a continuation of the battle against Israel. Read Israeli (statements and press). (Unfortunately), the Lebanese and the Arabs do not read much. Read what they say, what they write, especially these days, with the ongoing eradication of Daesh in Iraq, Syria and Lebanon, so that you realize clearly that Daesh is a true Israeli project. We are indeed facing the Second Liberation (of Lebanon). The date of the First Liberation is May 25, 2000. The date of the Second Liberation, for history, is today (28 August 2017). I do not mean the day (to be selected for an annual commemoration of this event). Today we wrote… Last time, today’s date, August 28, 2017, was empty (of any commemoration) in the calendar. But not for 2018. By the will of God, this day and this month are written by the Lebanese Army, the Syrian army and fighters of the Islamic Resistance in Lebanon. This was written today (in the annals of History): August 28, 2017 is the Day of the Second Liberation, which will be recorded as a glorious day in the history of Lebanon and the history of the region. Now whether the Lebanese government (led by the pro-Saudi Saad Hariri and his March 14 coalition, facing the movement of March 8, with Hezbollah and its allies) recognizes it or not, that’s their problem, just like what happened on May 25, 2000. The situation was somewhat different at the time, that date was declared a national holiday, then was removed from the calendar at the time of a previous Prime Minister. But then, thanks to God, a head of government redid the occasion of May 25 a day of remembrance. We now have an opportunity to commemorate: August 28, 2017. I speak only of the historical event that took place on August 28, I do not write the history (and national holidays) myself. But today there is no longer any daeshiste, takfiri, (member of) Al-Nusra Front or (any other terrorist) on the least grain of sand, any mountain or any Lebanese hill. It was on that date (this event occurred). After that, if the government wants to keep that date, or choose August 27, August 25, August 31 or September 3 (for the commemoration), I have no problem. I do not precede anyone, I speak only of the historical event. On this basis, I wish to conclude with this call (to celebrate this event this Thursday 31st, the day of Arafat, on the eve of Eid-al-Adha): you remember that on May 25, 2000, it is all Lebanon who won, and Lebanon was happy with the victory (against Israel), with the exception of those who had placed their hopes in the Israeli occupation, and there were (a number) in the country, and those who had placed their hopes in the army of Antoine Lahd. So on that day, there was a majority (of Lebanese) happy, and (a minority) of people whose faces were darkened (with bitterness) because their plans had collapsed. Today… But (in 2000), the happiest people, despite the fact that it was a national day, celebration and victory, were southerners, residents of southern Lebanon and Jabal Amel who were the happiest of all with this victory and this Liberation. The reason is simple: it is because the occupation took place on their mountains, their hills, their cities, it is their sons and daughters who were imprisoned, their peasants and farmer were fired at, and a daily threat was hanging over them. We remember the bombing against Sidon and Nabatiye and children and schoolchildren’s heads torn in the streets. It is quite normal that the people of the South, who are those who have suffered most and have the most sacrificed,were (more) happy on May 25, 2000. Today, all of Lebanon won, and logically, the vast majority (of the population) is pleased, with the exception of those who have placed their hopes on the Al-Nusra Front, on Daesh and the regional states and world powers that stand behind them. It is understandable that they are angry, saddened and dismayed, and they offer their condolences, it is normal. And a few days ago, 2 or 3 weeks, they have insulted, reviled and slandered us, but let them act as they please. We understand their sadness and pain. But with certainty, the vast majority of Lebanese are happy because without these (victorious) confrontations for several years to date, Daesh, the Al-Nusra Front and their like could have seized the Bekaa, the North and reached other places in Lebanon and we would have experienced a disaster. See what happened in the country and the societies around us (Syria, Iraq, Libya). But it is also natural that the happiest people in the Second Liberation are our noble people of the Bekaa. They are the ones whose mountains, Jurds and fields, were attacked with car bombs and suicide bombers, against Hermel, Bekaa and Ras Baalbek, and the whole area was threatened upto all Zahle and the Bekaa, and now that this nightmare disappeared from their mountains, their hills, their Jurds, their homes and their lands, they sure are going to be the happiest of all. For they have suffered more than all, and in this battle, it is among them that there was the most sacrificed (martyrs). Russian television correspondent Anna Kurbatova has been detained by the Ukrainian security services in Kiev. The journalist, who works for Russia’s Channel 1, will be deported for “smearing” Ukraine, according to a security services spokesperson. Russia’s Foreign Ministry is also trying to clarify the situation around the correspondent’s detention. The Russian embassy in Kiev has sent requests to the Ukrainian security services as well as a note to Ukraine’s Foreign Ministry, urging them to clarify the incident and immediately release the journalist, RIA Novosti reported. 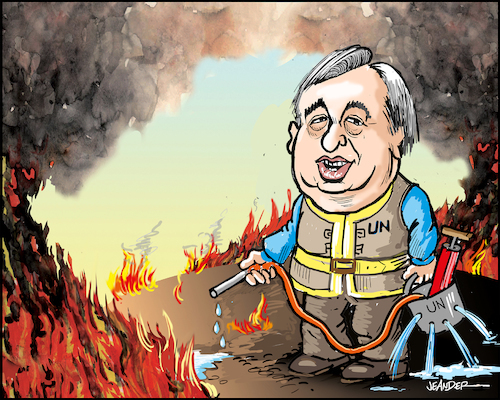 UN Secretary General Zionist puppet Antonio Guterres arrived Wednesday morning in the besieged Gaza Strip after he visited the Nazi regime and the occupied Palestinian territories as part of his first regional itinerary. According to the Palestinian Information Center in Gaza, Guterres and his entourage were allowed by the Nazi regime into Gaza through the Beit Hanoun (Erez) border crossing. Meanwhile, families of Palestinian prisoners in Nazi camp’s have been rallying since the morning near the Beit Hanoun crossing in protest at Guterres’s refusal to meet with them upon his arrival in Gaza. The UN chief had held several meetings with officials from the Palestinian Authority and the Nazi regime after he arrived last Sunday in the occupied territories, coming from Kuwait. Zionist puppet Guterres, who refused to meet with relatives of Palestinian prisoners, met last Monday with families of Nazi captives being held in Gaza and expressed his sympathy with them. According to the UNRWA, the UN secretary-general will read today a statement in one of its schools in Beit Lahia city, north of Gaza, before leaving soon on the same day. In the UK, parliament may still be in summer recess, but government ministers aren’t resting. Defense Minister Michael Fallon jetted to Oman August 28 to cement a number of military agreements with the Sultanate’s leaders. The inking represents a continuation of a longstanding and rarely examined “special relationship” between the two countries. During his two day visit, Fallon met with Sayyid Badr bin Saud bin Harub Al Busaidi, Oman’s Minister Responsible for Defense Affairs, in Muscat. The pair signed a “Memorandum of Understanding and Services Agreement” that secures UK use of naval facilities at Duqm Port — a multi-million dollar joint venture between the two countries. ​An official statement issued by the Foreign & Commonwealth Office said the “booming” Port complex would provide “significant opportunity” for the two countries’ “defense, security and prosperity agendas,” and serve as a home from home for the UK’s flagship aircraft carrier, HMS Queen Elizabeth. “This agreement ensures British engineering expertise will be involved in developing Duqm as a strategic port for the Middle East, benefiting the Royal Navy and others. Oman is a longstanding British ally and we work closely across diplomatic, economic and security matters. Our commitment to the Duqm project highlights the strength of our relationship,” Fallon said. The Defense Minister’s visit gained virtually no recognition in the UK media — while the traditional paucity of official government business to report on over the summer arguably makes the story a prime candidate for press coverage, radio silence on UK-Oman relations is a seemingly enduring mainstream editorial policy. Declassified British government files reveal the oil-rich Gulf state’s leader Sultan Qaboos bin Said al Said — one of the longest serving unelected rulers in the world — was brought to power in a 1970 palace coup planned by UK foreign intelligence service MI6, and sanctioned by then-Prime Minister Harold Wilson. The Sultan has absolute power in governance, and is also the country’s Prime Minister and Minister of Defense, with total authority over Oman’s judicial and legal systems. Ever since the coup, Oman has proven a most faithful ally to the UK, hosting a number of major British intelligence and military operations. For example, UK spying agency GCHQ has three separate bases in the country — codenamed Timpani Guitar and Clarinet — that feed off various undersea cables passing through the Strait of Hormuz to the Arabian Gulf. In the process, the bases intercept and process a vast volume of emails, telephone calls and web traffic generated in the region, which is then shared with the US’ National Security Agency. Moreover, UK troops have long trained Omani armed forces, and in May 2016 it was announced the UK would increase its number of training teams in Oman from 34 to 45 in 2017. We all know that the last of the JFK assassination records are due to be declassified in October. And we even know what the government says it’s hiding from us. But do you know the story that the CIA is trying to plant in the public consciousness about what is going to be “revealed” in these documents? The original video was published in September 2013 on this channel https://www.youtube.com/watch?time_co… . This is a shortened version of that video. It shows children being instructed by terrorists to act like they have been hit with Sarin gas, they convulse, they’re eyes blink and they froth at the mouth with fake foam applied to their faces by terrorists. A of children applaud. A man in a Mickey mouse costume tells them it’s all fun.